A woman packs up her belongings before she was evicted from her home near Wat Kanalaya. She said her family had lived in the neighborhood for more than 100 years. This picture was made last week. The home was torn down this week. 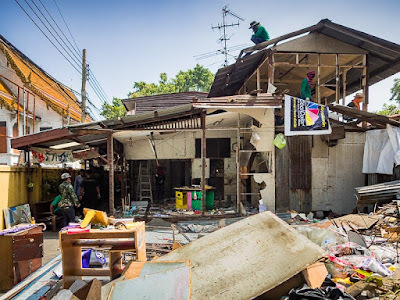 The eviction of residents from the neighborhood around Wat Kanalaya and the destruction of their homes is continuing. Fifty-four homes will be torn down but the project is going house by house and, at this point, all of the work is being done completely by hand. No electric power tools or big demolition equipment. I wouldn't be surprised if it took months to completely tear down all the homes. It's a sad thing to see, like watching someone rip off a bandage little by little, the pain just continues. 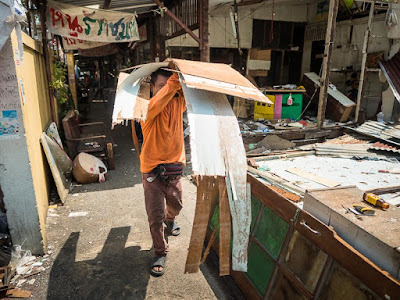 It also means people have extra time to find new housing but the mood around the temple is melancholy. Women who are being evicted chat in front of a shop that will soon be torn down. 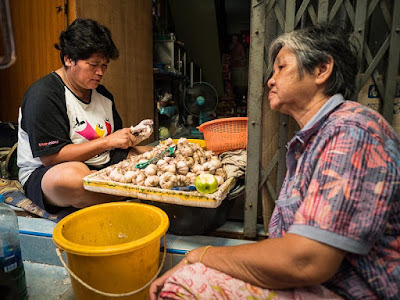 The woman on the left is peeling garlic. 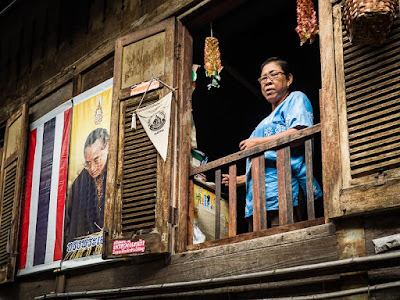 I am going to the Wat Kanalaya neighborhood a couple of times a week to photograph the people there as the neighborhood changes. It's interesting working there and working in an environment where you can't talk to people (because I don't speak Thai and nobody around Wat Kanalaya speaks English). You'd think that this would be a recipe for failure. I am trying to make pictures of people at their most vulnerable and at a time when they are losing their homes. This is not photographing a wedding or birthday or happy event. I wasn't sure how I would be received but I've been astounded at how welcoming the residents are. Every single person I've asked has said it was okay to photograph. Since I don't speak Thai and they don't speak English, we're doing this via sign language and body English (body Thai?) but not one person has said no or turned me down. Some have invited me into their homes for lunch. Packing up a home that has been torn down since this picture was made. I always carry a Thai-English dictionary and I use a translation app on my iPhone. I usually start by "asking" via sign language if I can photograph. If someone asks me why I'm photographing (at least I think that's what they're asking) I use the dictionary to tell them I'm a journalist. (The Thai word for journalist is pronounced nák k`ee-an n`ang-s`eu pim and I never, ever, get it right.) Then I use the translation app on my phone to tell them I am working on a story about how the Chao Phraya riverfront is changing (the temple is on the river and is one of the first of up to 200 communities that could be razed to make way for new riverfront developments). 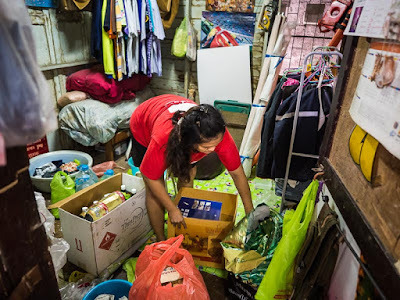 I am overwhelmed by the generosity of Thais. After going through the "why are you photographing?" routine one resident of the community literally grabbed me by the hand and walked me through the area pointing at homes and making a sweeping motion while she was looking for her friend who apparently speaks a little English. The friend was gone for the day, so our conversation was short. A woman being evicted in the window of her home. People are staying in their homes up to the day before it is torn down. 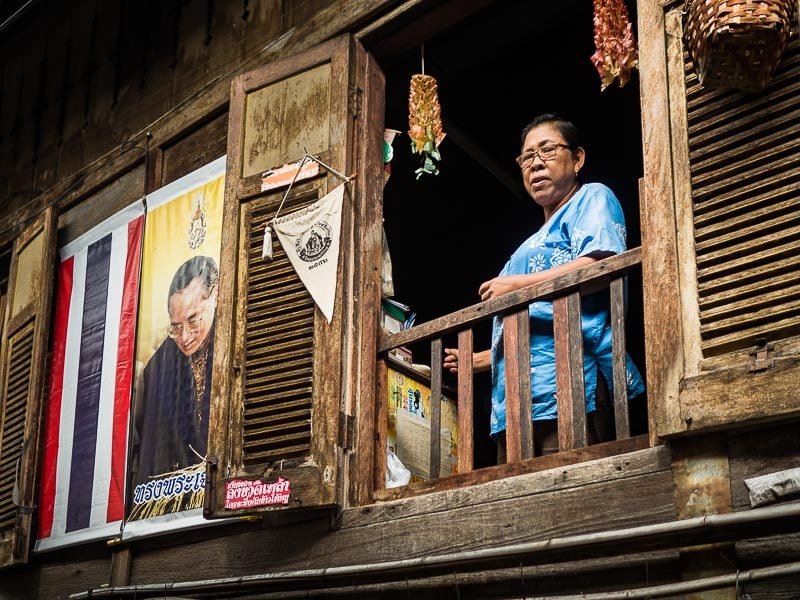 The Thai flag and a portrait of Bhumibol Adulyadej, the King of Thailand, hang on the front of her house. Another time I was walking through the community and a family I had seen a couple of times, but never photographed or had any interaction with, invited me in to share their lunch. 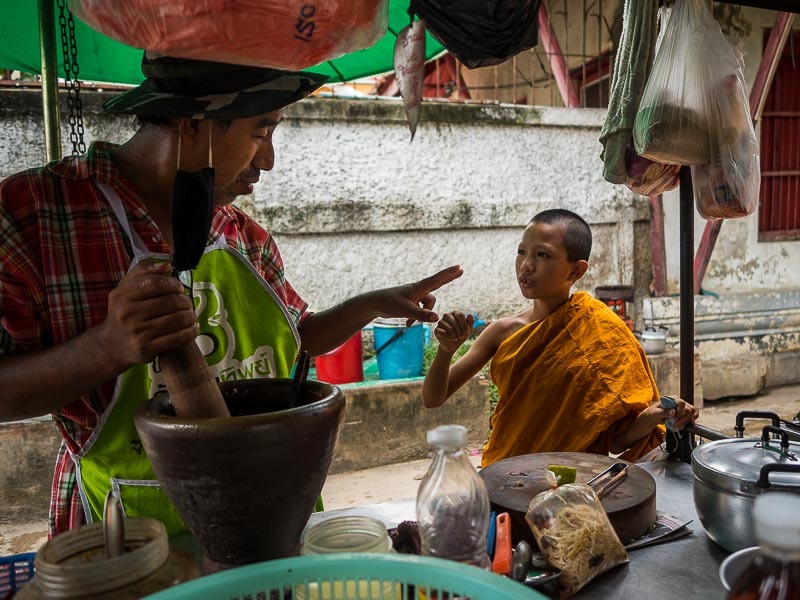 The same day a woman I had photographed pressed a bunch of bananas into my hand and when I pulled out some Baht to pay for them she turned up her hand and said "gift." This is a complicated story. Most of the people around the temple are angry that they're being evicted. But their homes are temple land - they don't dispute this. They don't have leases in the US sense. They've been living in their homes, paying rent to the temple, for generations based on a gentleman's agreement of sorts with the abbot. About 9 years ago, the temple got a new abbot. He has plans for the land, as is his right, and wants to redevelop the property around the temple. He also says he has concerns about the safety of the homes, many of which are made out of scrap wood and wired without any thoughts to grounding or safety. Plus the area floods a couple of times a year (the area along the river floods under predictable circumstances. Heavy rains at very high tides guarantee flooding which may only last a few hours but is a problem none the less). A somtam (papaya salad) vendor talks to a novice monk from a nearby temple in the Wat Kanalaya neighborhood. All of which makes it hard to say there is a villian in this story. What's not hard to say is that there are a lot of victims. 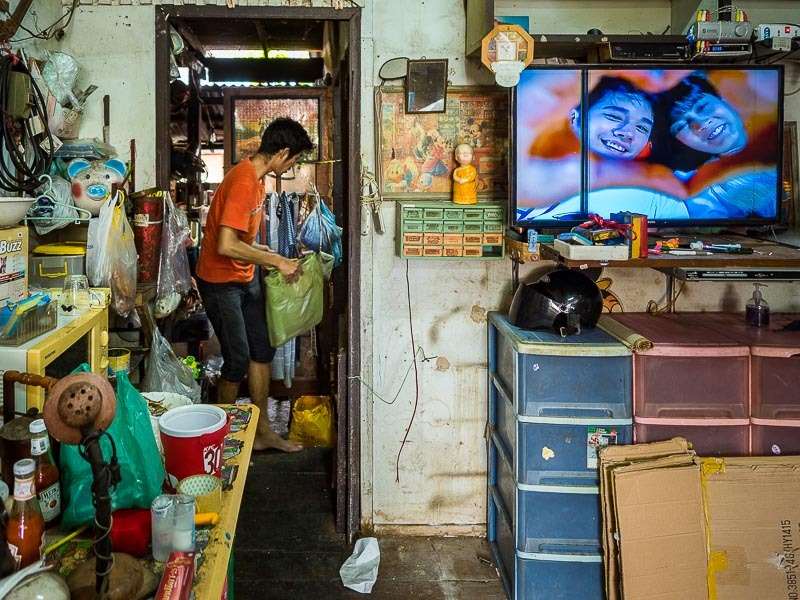 In a country with a yawning income gap (although the income between rich and poor in Thailand is less than it is in the US), it's the poorest citizens who are displaced by gentrification. Demolition crews tear down a house near Wat Kanalaya. 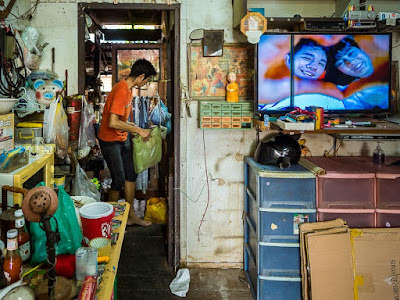 I am going to follow the changes in the Kanalaya neighborhood, including going back with a Thai assistant to do some proper interviews. I will update project when it's merited.